From May 19th to Sep 10th, 2017. 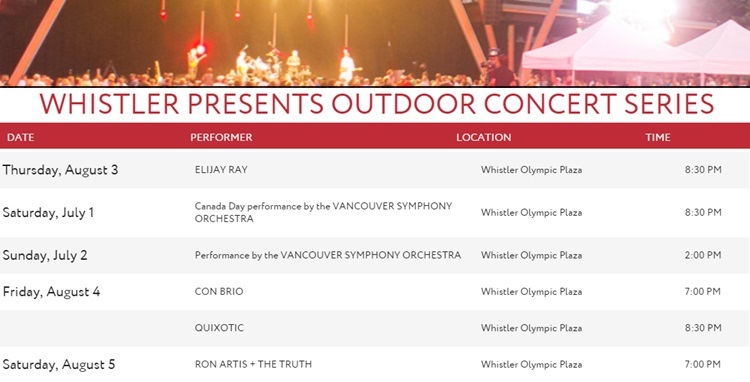 Get ready to enjoy another spectacular season of free outdoor concerts in Whistler Olympic Plaza. From the sweet sounds of classical music to chilled out beats and local folk bands, Whistler Olympic Plaza is the place for free outdoor concerts this summer. Every year since its inception in 2010, the event has been a recipient of Get Out There Magazine's Readers' Choice Award for Best Cycling Event in Western Canada! The 50 mile (80km) course will consist of 4 loops of approximately 20km, with the 20km loop divided into approximately 13km and 7km legs for the 8-person relay. Odd legs (1, 3, 5, and 7) will run 13km and even (2, 4, 6, and 8) will run 7km. The 4-person relays will alternate 20km loops while the 2-person relays may alternate 20km loops or run 40km each. The 50 mile total distance will be certified.